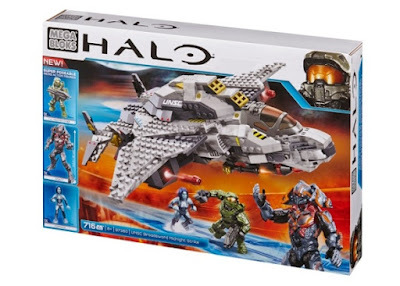 Back into the jolly brick-built world of MEGA Bloks we plunge, this time with a trip to 2014 to check out one of the larger Halo sets from that year. We're happy, not just because this set includes the newer kinds of figures and is fairly large, but because its also quite a bit bonkers. We build the Broadsword Midnight Strike. Thar she blows! The first thing you notice about this build is that the finished product, the Broadsword, is bloody thick. MEGA Bloks certainly like to fill in empty spaces, making the fighter quite heavy. It took us about four hours to assemble it, in what was actually quite a tricky build with lots of different directions and techniques utilised. At first that 'hump' on the ship's back was a little off-putting, destroying the sleek looks shown off in the previous photo. However, those gold inlets on the front, and the tiered build at the rear of it, help to add a lot of charm to the overall aesthetic. This shot shows off the craft's weapons at the front; two positionable machine guns on either side, a dirty great bomb to drop up front, and two red missiles on the wings that actually shoot. You can also see the many air-inlet parts along the body and wings, which we think look great and add to the sense of realism. Obviously the forward cockpit can be opened to accommodate one figure, in this case the included Master Chief himself. There are some great details in the nose, including a control panel and multi-directional building. ... a lovely removable weapons rack for the Chief. Look how happy he is with it. Ooo, which gun first, Chiefy? Yes, the instructions advise you to almost smother the build in stickers, but fortunately not all are necessary to the overall look. Thankfully only one or two have to go over multiple parts (something we bloody hate doing), and those are quite cool, such as the UNSC crest above. Included on the sticker sheet are also several 'extras' allowing you to personalise the tail fins. There are four pairs of designs that you can choose, meaning that you can style up your Broadsword a little differently from the next. We opted for the classic Spartan helmet motif. Give the bird a flip and you'll see what we mean by the multi-directional building techniques. Although the underside of the wings show the 'anti-stud' side, most other under-sections are neatly bricked up, meaning this looks great even when displayed high on a shelf and all you see of it is the underside. Dear LEGO, do this more. Displaying the Broadsword is helped in no small part by the inclusion of a tonne of transparent bricks to construct a stand. Yep, the one you can see in all the pics is actually included, which is great. It gives the Broadsword a nice amount of elevation and lets you display the model amongst other shorter builds. Shelf space is pretty important, after all. Onto those interesting figures now, and included is (L to R) Master Chief, Cortana, and Didact. A real mixed bag of characters and also of figure styles. First up, the Chief. Our first Master Chief figure, this guy looks great and is instantly recognisable as the main character from the game series. He gets the new (and quite frankly awesome) style of interchangeable armour, and also the classic assault rifle. 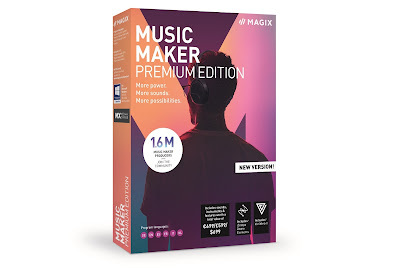 Check out this review where we go into further detail about the new system. The level of detail on the figure is good, with some specially painted battle damage on the chest plate. Next up, Cortana and... erm... okay. We'll be honest, we're not fond of this thing, as it neither looks like the in-game Cortana, nor does it look very well proportioned. It is quite well articulated, but those elbows don't bend, and what is it with the position of the right arm? Is she trying to look sassy? Nevertheless, the level of detail is good, and the figure itself is certainly unique, coming only (in this form, at least) in this set. She might not have much display or play value, but y'know, she's interesting. And here's the big fella! 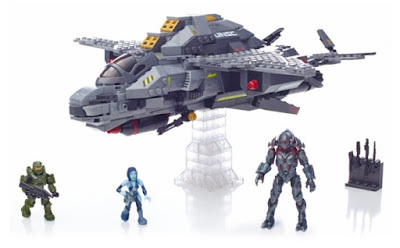 Didact stands twice as tall as the usual Micro Action Figures, yet features the same level of articulation. The moulding and paint work on him is fantastic, and he can be positioned in truly menacing poses. He's a single piece, so that armour can't be removed, but placing this amongst your collection of figures will certainly make him stand out. Didact is definitely one of those figures you'll want to collect, being supplied only with this set. We're guessing that collectors who don't actually like the look of the Broadsword might buy the set anyway, purely to get their hands of this guy. We don't blame 'em. And yes, he can hold Master chief aloft, thanks to both the shape of his hands, and the Chief's helmet. It's always nice to recreate classic in-game scenes, ain't it? Although the ship itself might not be everyone's cup of tea once finished, this set provides a fun build, some great parts, and an interesting selection of figures. Although now discontinued by MEGA Bloks, Broadsword Midnight Strike is still very much available on-line, and we were able to pick ours up on eBay for around £30. Shop around and you're sure to find a bargain.